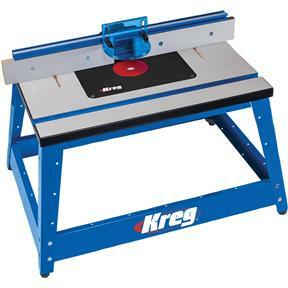 Kreg's freshly redesigned Precision Benchtop Router Table now offers even more features that give it the capability of a full-size, industrial router table in a portable package. 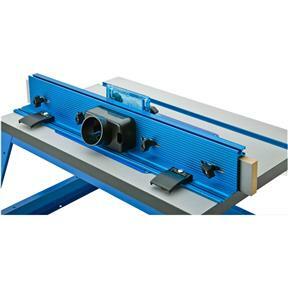 Whether you want a router table to use on a job site or compact router table to use in the shop, the Precision Benchtop Router Table is a perfect routing solution for you. The table top is made from a professionally edgebanded, vibration and noise resistant MDF which features an Easy-Slide™ Micro-Dot skin – constructed from a high-pressure laminate – which makes it easy to slide workpieces across the surface. The insert plate measures 9-1/4" x 11-3/4" x 3/8" to support even the biggest routers, and it features Kreg's new Level-Loc Reducing Rings. The heavy-duty aluminum fence has been redesigned, too, with new easy-to-use cam clamps that allow quick fence adjustment and confident locking. This table was built to withstand years of use and abuse on the jobsite, all built with mobile professionals in mind. This is a very nice and sturdy table but I wish that it came with measuring scale on each side to help with moving fence and having both sides the same and I don't like the guard. I wish it had come with featherboard instead. But still I would buy again and recommend.